Observation - Fire salamanders - Global. 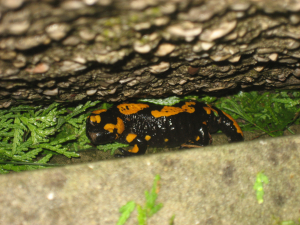 Description: The fire salamander shown near a wall was about 6 inches long. I picked it up fom my driveway to move it to a safer location and was de-energised for the next 3 days spending most of the time in bed. I developed a rash around my waist. The fire salamander shown near a wall was about 6 inches long. I picked it up fom my driveway to move it to a safer location and was de-energised for the next 3 days spending most of the time in bed. I developed a rash around my waist.